Soilfloc is a polymer based soil sealant that can be applied through the water column to seal soil seepage without draining the pond or reservoir. It is non-toxic, biodegradable, and has been tested for impacts to aquatic organisms in major University Studies. It can also be applied during construction to improve the soil's sealing capability. This is by far the most cost effective method to attempt to seal a pond without completely draining the water. The 2-Part polymer based sealant is supplied in a fine granular form. Each unit includes 55 pounds of Part A and 55 pounds of Part B. Each 110 pound unit treats approximately 3,000 square feet of pond bottom. Heavier application rates may improve effectiveness. Soilfloc Sealant is the product of choice for sealing leaks without dewatering ponds, reservoirs, irrigation ditches, watering holes, golf course water hazards, and residential ponds. If your pond / lake / reservoir has water in it & is currently leaking, now is the best time to apply. The flow toward the leak, draws the polymers into the problem areas to seal the leaks. Not recommended for application to water bodies less than 10,000 square feet in size. Remove any deep silt, livestock, dense reeds or heavy vegetation, as they can impede the polymers ability to get to the seepage. Simply sprinkle Part A and Part B over the surface of the water. The water should not be moving and you should not apply during rain or wind events. Distribute it as if you are “feeding chickens” at the recommended rates. Remember to cast out gently no more than 5’ by hand, scoop or fertilizer spreader from a boat or raft. Soilfloc Sealant Part A 2 oz. per 10 sq. ft.
Soilfloc Sealant Part B 2 oz. per 10 sq. ft. Apply Soilfloc Sealant Part A to approx. 10 sq. ft. section first followed immediately by Part B to the same 10 sq. ft. before moving to the next section. What is flocculate and hydrate? Anionic polymer has molecules that carry negative charges. They attract positively charged suspended clay particles much like a magnet picks up metal. The other unique aspect of the formulation is the anionic cross-linked, insoluble polyacrylamide, which absorbs and retains large amounts of a water (over 300X its weight). Together, this powerful combination is pulled into cracks and crevices by the draw of the leak, binding suspended and surface solids, and swelling to over 300X its weight, to plug the leaks and stop the flow of water. The full effect of a polymer pond sealant treatment is usually not seen until at least 3 weeks after treatment. This product works exactly as described. It's quick and simple to use. Just have to wait for the perfect timing to apply it. Just a follow up that I did receive the Soil Floc sealant and applied it as directed on Dec. 23. I can't hardly believe it, but I think it actually worked!! A couple of days after application, the pond level started to rise as I continued to pump water into it. Previously, the water was leaking out as fast as I could pump it in. The pond filled up, and I shut the pump off. After two days, it has only gone down about 1/2 inch….which means it's still leaking a little, but nothing like it was when it would go down an inch or more in a 24 hr. period. I did find two dead fish the days after I applied. I can't say that was caused by the Soil Floc, but even if it was, two is no big deal…..if that is all that died. Should it continue to "seal" as time goes on? If this proves to have worked, I will say it is the ONLY product I've tried that actually worked. I put 10,000 lbs of Bentonite in the soil in two different applications and that did not seal the tank. I previously reviewed this product after applying it to two small ponds that have the same gravel base as the one I recently treated. The ponds are in west TN. They have a large draining area so can accumulate al lot of rain water but have no natural water source such as a creek or spring. The ponds can hold water after a rain but never reach even half capacity. . The smaller ponds had steep side slopes and were easy to treat being roughly 1500 square feet in surface area. I over-applied by using 110 pounds (55 and 55) for each pond. The recommended area per 110 pounds is 3000 square feet of pond bottom. Soilfloc worked well by greatly reducing the leaks. Based on this result I recently treated a larger pond with the same gravel base. The pond would hold some water for a couple of weeks at a time depending on the amount of rain but then would slowly go completely dry in less than a month. 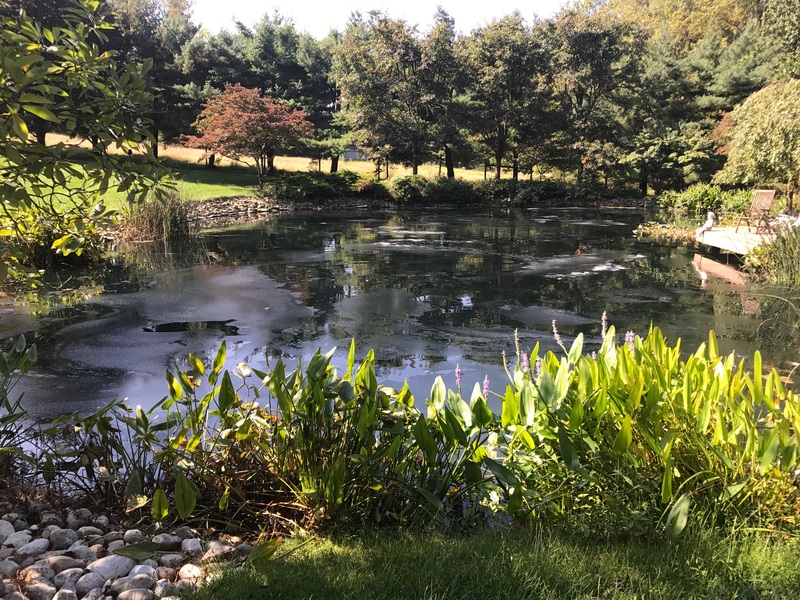 The current pond water surface area is roughly 4000 square feet but has the capacity to cover over 30,000 square feet. The logic was to treat the water level after a rain before it leaked. If the Soilfloc worked then keep treating the new water levels. I used approximately 180 pounds (90 and 90) of Soilfloc. The air temperature averages 60 degrees during the day so there is little surface evaporation. After about a week the pond has lost over a foot of water. I can think of a couple of reasons for the pond not holding water after the treatment. First, being all gravel and dirt the pond leaks all over, not just at certain points. A clay or dirt soil would work better. I probably would need to double the amount of product even though I was well over recommended dosages. Second, it is recommended that Soilfloc be used in 4' or more of depth. One side of the pond has only abut a 20 degree slope and the other side perhaps 30 degrees. Thus water on the edges is not deep enough. I need to see how much more the pond recedes. hopefully at the deeper depths it will hold. My other hope is that we get substantial winter rains that fill the pond faster than it leaks. Thus, as I treat the newer water it might hold. With subsequent treatment I may be able to stop most of the leaks although it may end up costing me a fortune. Anyone else in this situation is advised to compact the pond bottom well and to bring in clay prior to the pond getting water. I was skeptical but it worked! Applied to 1/2 acre pond with leaking dam. It took about 3 weeks but all the wet ground outside the dam dried up and it is holding water much better now! Definitely worth trying at the price.